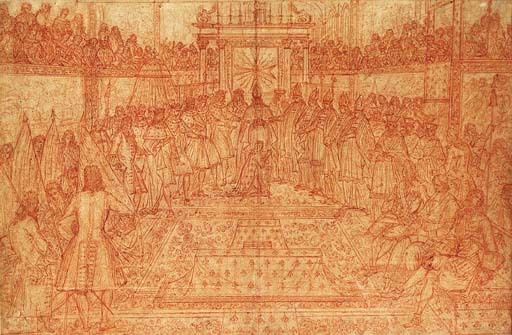 A study related to a larger compositional drawing in black chalk engraved by Desplaces depicting the Coronation of King Louis XV, one of 57 sheets bound with their corresponding engravings in an album at the Louvre, J. Guiffrey and P. Marcel, Inventaire Général des Dessins du Musée du Louvre: École Française, Paris, 1909, IV, nos. 3740-3797. The sheets were engraved for Le Sacré de Louis XV roy de France dans l'église de Reims le dimanche 25 octobre 1722, Paris, 1731, commissioned jointly by the duc d'Aumont, the duc de Gesvres, the Abbé Bignon, Royal Librarian, and Gros de Boze, Keeper of the Cabinet des Antiques et des médailles du Roi. This tradition of publishing elaborate books to record the major events which punctuated life at court was begun by King Louis XIV. As no visual record was made of the coronation of the Sun King himself, on 7 June 1654, it was decided that a major publication should be commissioned to commemorate each subsequent coronation. The drawings were executed by Pierre Dulin and engraved by Audran, Cochin the Elder, Desplaces and others. The scene in the present sheet shows the choir of the cathedral at Rheims. As Gothic architecture was regarded at the time as barbaric, temporary structures were installed to accommodate the guests, while a double row of tapestries were hung to mask the nave. The special tribune visible on the left of the present sheet was built for the Princesse Palatine, the Regent's mother, the duchesse de Lorraine and the Infant of Portugal. The Archbishop of Rheims holds the crown over the child's head, surrounded by the Regent, Peers of the Realm and Prelates. The duc de Villars, gouverneur du Roi, stands behind holding the Sword of State.